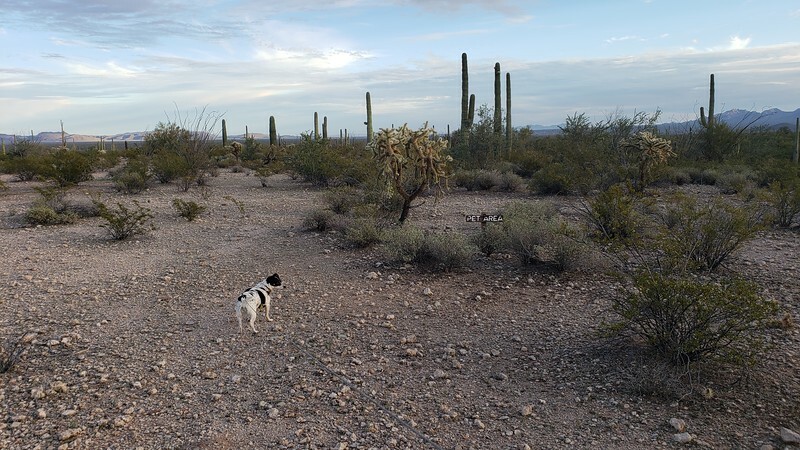 Last year when we were on the way to Tucson, we decided to cut south from Gila Bend and visit Organ Pipe National Monument along the way. We thought a simple drive through would be OK for this time around. 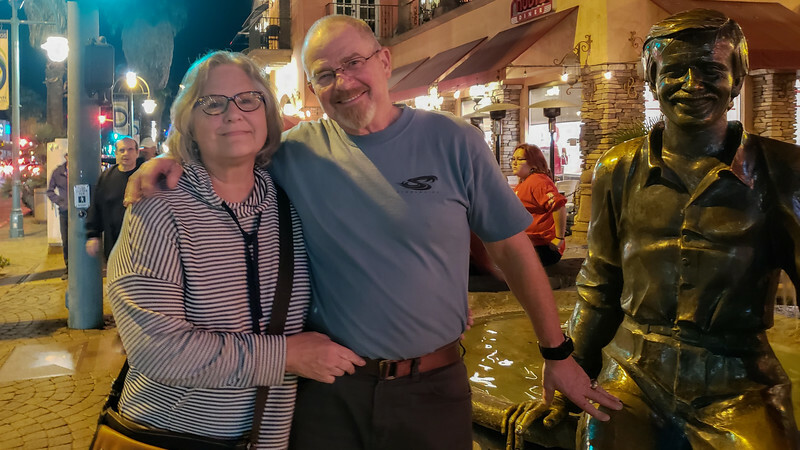 However, the charming little town of Ajo caught us off guard, and we spent many hours of our free time exploring the museum, architecture, and colorful murals. 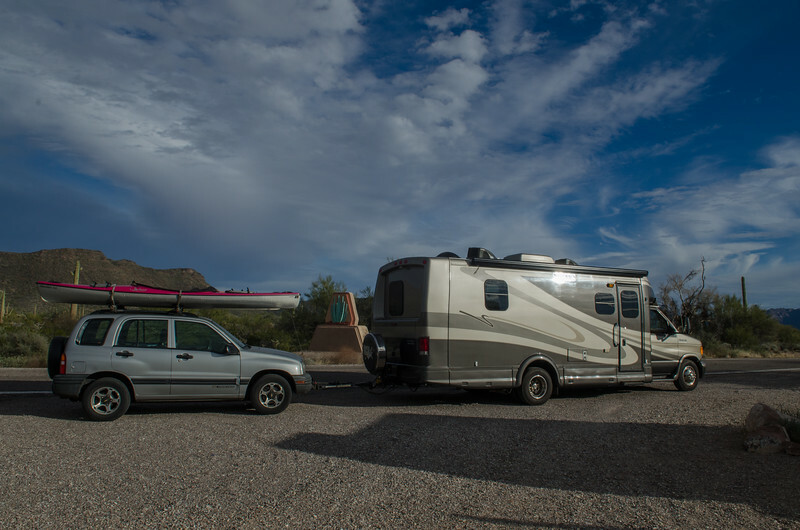 By the time we were ready to leave, it was late in the afternoon, and we needed to get moving to check in at Davis Monthan Air Force Base before 5. So much for Organ Pipe. 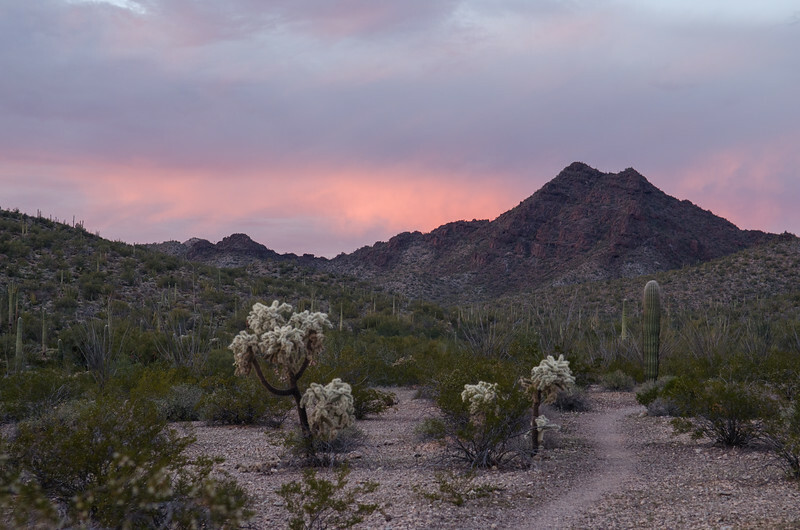 Thus it happened, that when planning this year’s route east, I opted for a couple of days at Organ Pipe. 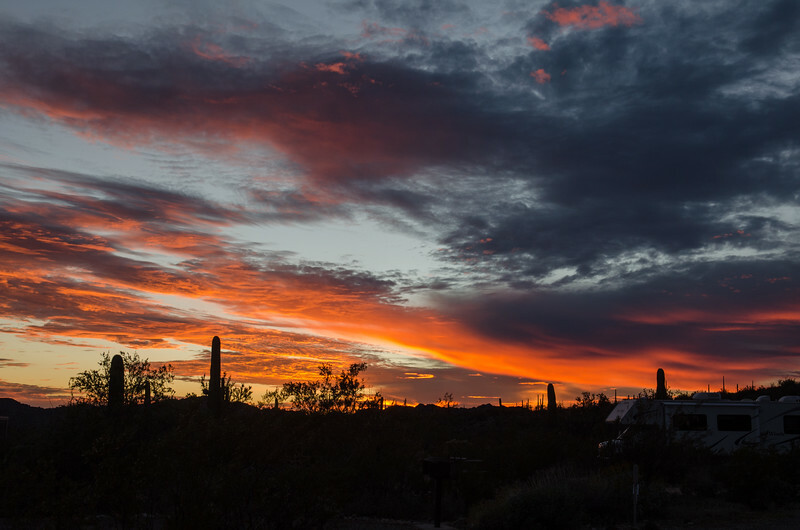 Now I know several people, including Al and Kelly, who think 2 days at Organ Pipe isn’t nearly enough, but at least it is something. This trip east is supposed to be a fast run to Florida, without all the meandering along the way that we did in 2014, so 2 days is actually a big deal for us. We even decided on making reservations at the Twin Peaks Campground inside the monument rather than taking our chances with a boondock site. When we have all the time in the world, wandering around hunting for a good boondock site is fun, but not this time. On our way in to the park, we did see a ton of boondockers in the desert in the area before the park boundary. Next time perhaps. Then again, there is something very nice about this campground. We are on an end site, number 70, in the area that allows generator use between 8 and 10 and then again between 4 and 6. Plenty of time to charge up batteries for phones, computers, make a pot of real coffee, process photos and write blogs. Surprising to me, I also have 4G Verizon reception out here in the middle of nowhere. Perfect. However, there is no television reception with our new digital tv and antenna. I suppose someone with a satellite would have wide open skies. We won’t have time for TV anyway, but still wanted to test our new system. Yesterday morning, we left Catalina about 45 minutes later than planned . The brothers and wives came down to our site to wish us safe travels and with lots of conversation and laughter we found ourselves pulling out at neatly 9 am instead of 8. 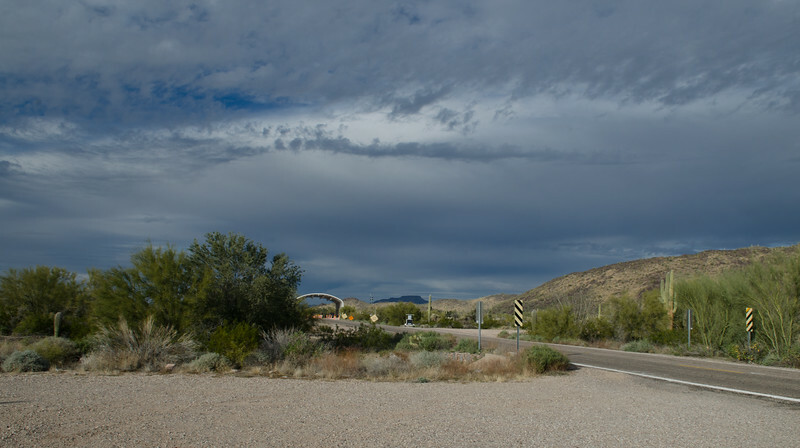 We decided to take the I-10 route all the way east to Highway 85, and then south to Gila Bend. On our last two trips to the desert we have traveled past the Salton Sea and south to I-8 to cross Arizona. Thought it might be time for something different. Interstate 10 definitely is not exciting, but it is fast and mostly smooth and easy. I didn’t mind that part at all. No dallying along the way, with a fuel stop at the Love’s in Gila Bend, and we arrived at our campground just after 5. I didn’t even try to get windshield photos during the time Mo was driving. 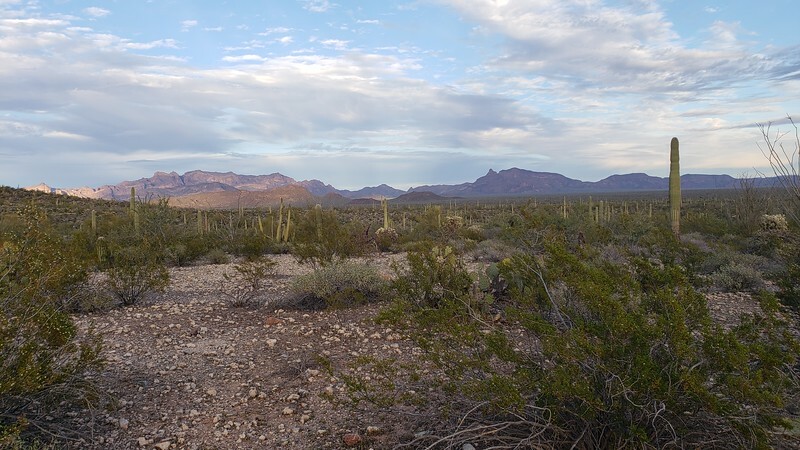 The desert is so beautiful, and it is amazing to watch the transition from the Mojave to the Sonoran Desert. As Mark has mentioned, the Sonoran is rich and lush compared to the Mojave. There is every shade of olive, lime, and soft sage green that you could imagine, with palo verde, mesquite, and the stately saguaros, plants that do not grow in the Mojave. Creosote is thick in both kinds of desert, but here in the Sonoran, with the recent rains it is especially lush. Once we turned south from Why, on Highway 85, the desert opened up in ways that give your eyeballs a real workout. The open, wild desert stretches from horizon to horizon as far as you can see in all directions. The mountains around here are gorgeous. Crazy wild things in all shapes that make them look like they are brand new, just emerged from the center of the earth. They can’t be that new, since there are huge ancient alluvial fans spreading out in all directions from those mountains. Still, I can’t wait to get to the visitor center this morning to get the skivvy on all the rocks and mountains and plants and animals. 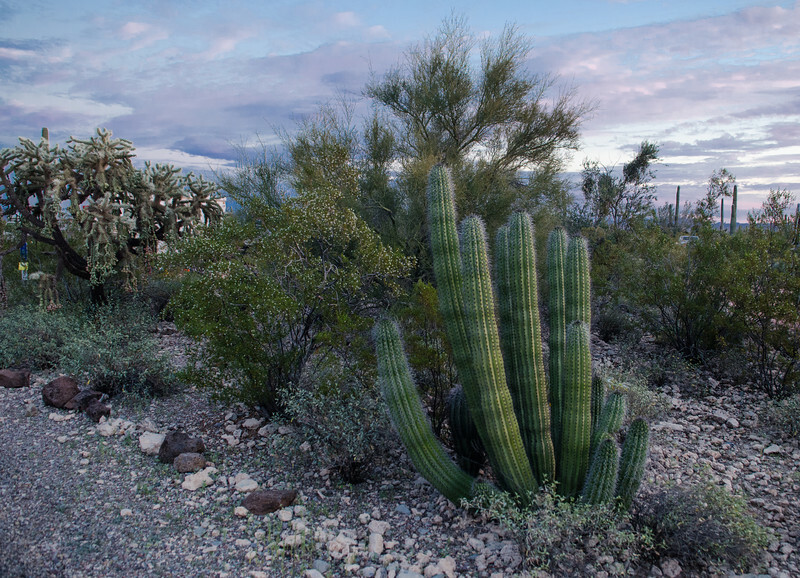 We have spent time in the Sonoran desert but not in an ecological wonderland like this. Our space was waiting for us, with a nice little sign with my name on it. It had been a crap shoot until last Saturday when at last the government shutdown ended. 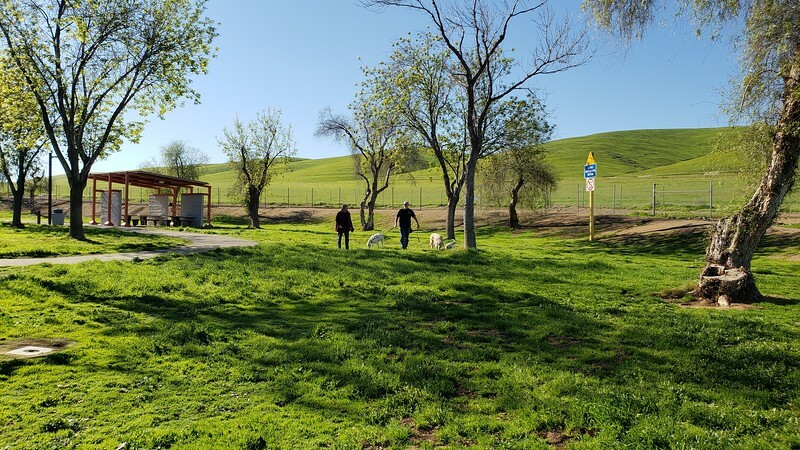 Prior to that, we knew that there was no one taking care of the park, the visitor center was closed, and there were squatters in the campground. Our prepaid reservation would have been worthless if the shutdown had continued to this week. We were prepared for trying to level up on rough ground, worrying about the jacks sinking into the sand. Imagine our surprise when we found a long, smooth, level cement pad waiting for us. There is plenty of room to open our slide on one side and our awning on the other, and a nice big patio area and cement picnic table. At sunset, I walked around the perimeter of the park, where there is the “Perimeter Trail” where dogs are allowed. There are so many bathrooms here that I had a hard time figuring out where I was, but I didn’t bother checking them out yet. The campground is about half full. At six, the soft generator sounds stopped almost entirely, (always has to be one that pushes the envelope) and the park was incredibly dark and quiet the rest of the night. If you choose to skip the generator noise entirely, there is a large section of the campground that allows no generators. We don’t have solar so we do need the generator. As I returned from walking, I noticed a lot of people with their hoods raised. Why would everyone be having car trouble? Then as I looked at the signs at the restrooms, I saw the notice that there are pack rats in the desert that love the kind of insulation inside the hood of vehicles. They suggested you could protect your vehicle from the damage by leaving the hood open. I came home and told Mo, and we opened both hoods. I think people who come this far out of their way to visit a desert must love the desert. Unlike Joshua Tree which is so close to such a huge population, here it is an effort to visit. I do think people who love the desert for something other than a place to run their 4 wheelers have a different ethic. Nothing against all 4 wheelers, because I do know lots of good responsible people who love to ride in the desert. I wish all people who had 4 wheelers were like them. People here seem to be more intent on hiking and appreciating the environment, and treating it with respect. So far at least. That makes me very happy inside. We hope to learn and hike and drive and explore this lovely place today, and the partly cloudy skies and moderate temperatures are quite welcome. We will be leaving Catalina this morning, heading south for a wilder environment, sans hookups and swimming pools. 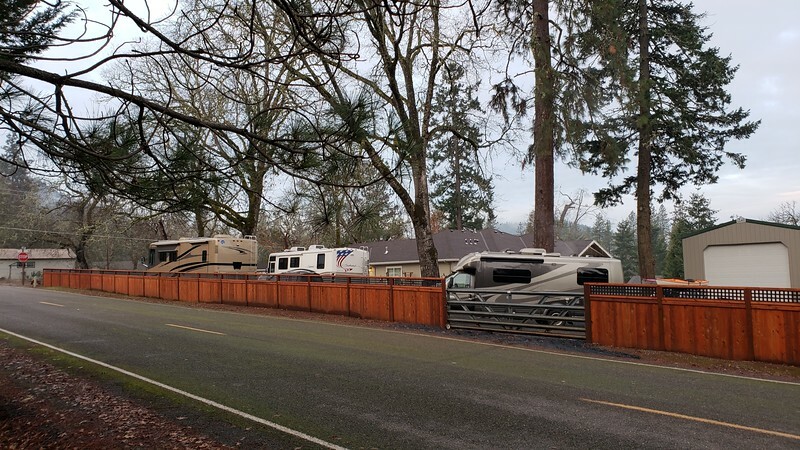 5 to 7 days here in the full campground is just about enough, and we did book for another week next year, locking in a great price, and ensuring that we will have a warm place to escape the inevitable foggy inversions that are part of lovely Grants Pass in January and February. The Brothers arrived early afternoon on Saturday, after leaving behind the dusty, crazy, fun times at the Big Tent Show in Quartzsite. 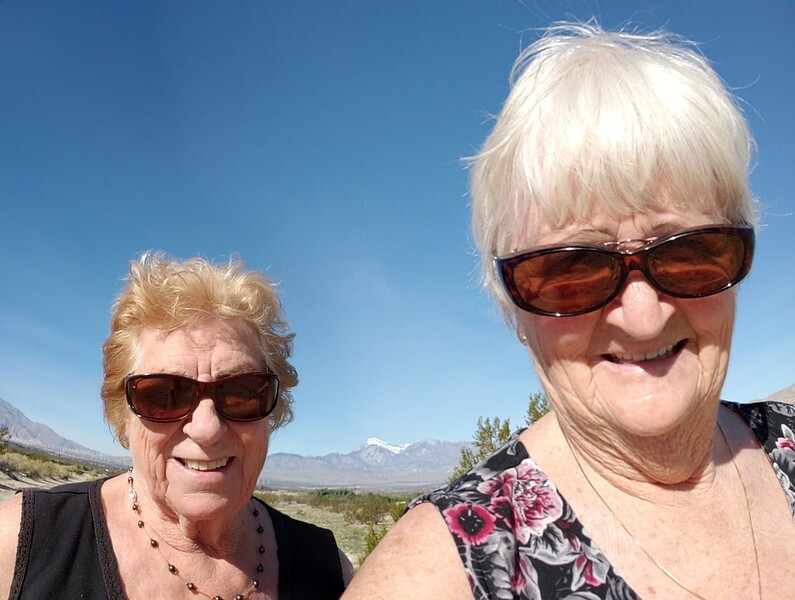 They had a good time, camping with another friend of theirs, doing a LOT of shopping, and simply enjoying the somewhat unique ambience of the “Quartzsite Thing”. That “thing'” draws a lot of people year after year, many who return over and over for all that is offered. Open almost free desert spaces, lots of socializing and friendships shared, and of course, shopping for “stuff”, especially RV stuff. So glad they enjoyed themselves, and glad we have done it in the past as well. Every RVr should at least experience what it is all about at least once. 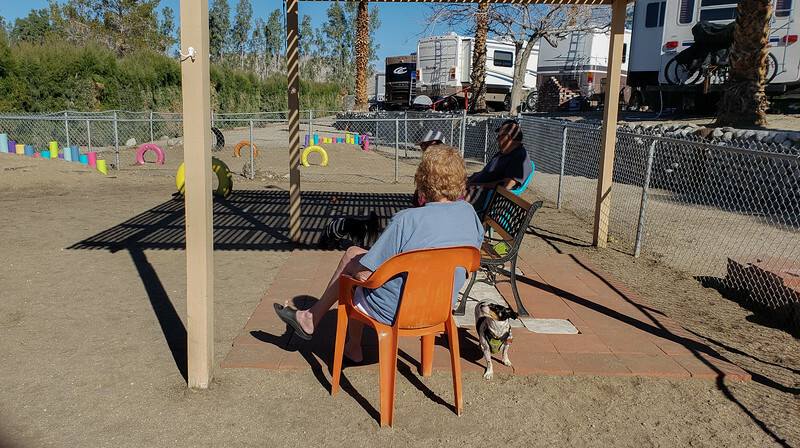 They settled into their spaces, put up awnings, and we showed them around the park a bit before making plans for dinner in Palm Springs. Mo and I usually save our Palm Springs dinner out for the night of the Street Fair, so this time, on a Sunday night, it was a bit easier to park. We had no trouble at all getting an outside table for 6 at Maraca’s, the Mexican restaurant we return to most often. 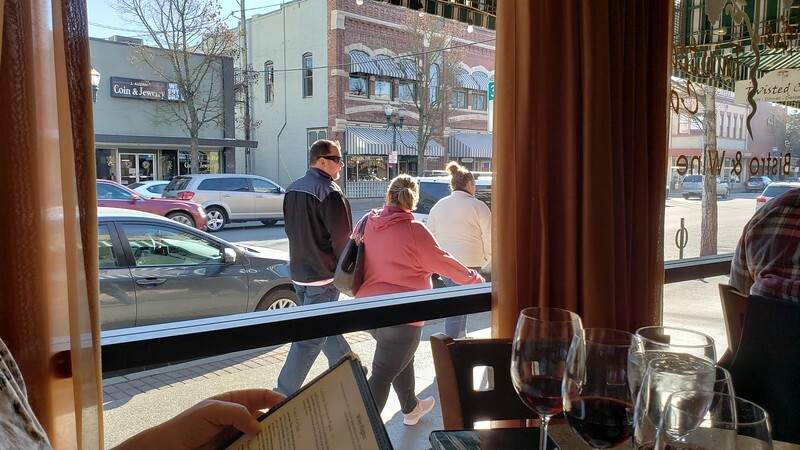 It is right on the main drag corner, with outside tables that are great for people watching, and the food is quite good. There are many Mexican restaurants to choose from in the area, but this one really does include good food AND good Palm Springs ambience. 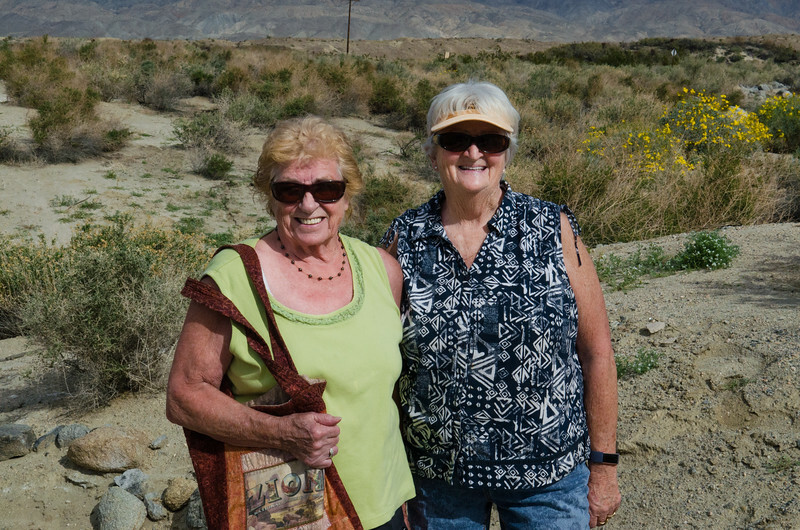 The next morning, we made arrangements to meet at 10AM for a drive east to Thousand Palms Oasis. There was a bit of overcast to the skies, but the temperatures were quite warm. Extended hiking isn’t on the menu for the family, so we thought walking around the short trails near the ponds would be a good choice. 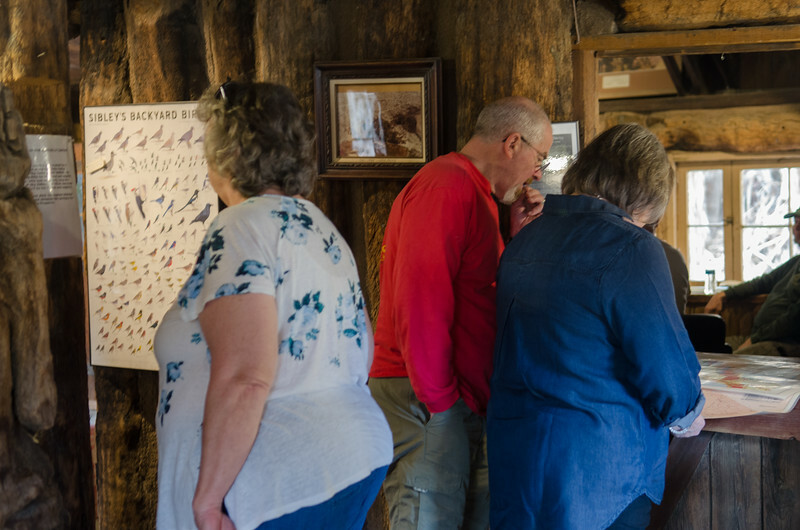 The Visitor Center at Thousand Palms is small and truly charming, built from huge palm logs, and the docents are knowledgeable and interesting. The most surprising of all were the flowers. 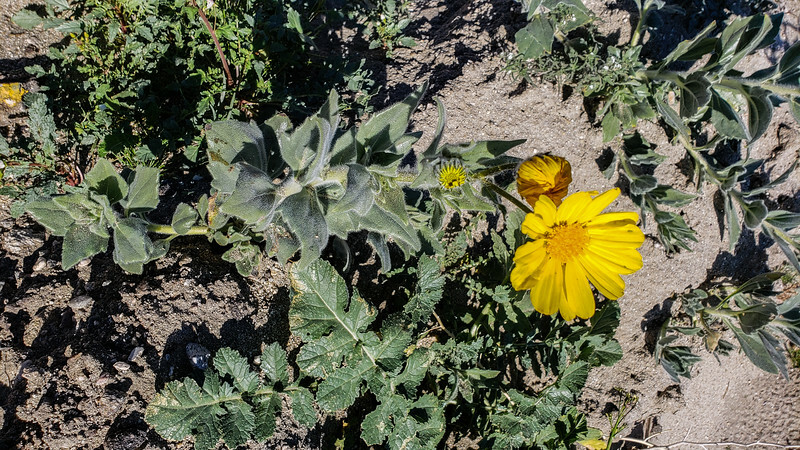 From a distance we saw the brown hills where Mo and I once wandered and almost got lost were covered with desert sunflower, sand verbena, and brittlebush, in full bloom. You can read about that crazy hike here. I was sorry that we wouldn’t have time to hike those hills on this visit, since we have never seen this part of the desert blooming to this extent. Even from a distance, it was a sheet of yellow haze over the barren hills. The warm afternoon after our return was the perfect time to gather under Dan’s awning for a long, chatty visit with family. I had to laugh, since Mo and I travel alone most of the time, because we were all sitting out there doing the family visiting thing that I see happening so often. It was fun to actually be part of that for an afternoon. We did skip the family dinner, so that we could finish last night’s leftovers and have time to do pre-departure chores, like rolling up the rugs, putting away the chairs, dumping the tanks. After supper we returned to Dan’s to visit a bit more and convinced them to try the pools. We swam in the upper pool this time with Dan and Don and Chere, but skipped the crowded hot spa. The bigger pool is a bit more open, and quite a bit cooler than the Lower Pool that we love. By the time we were finished I was actually chilled and need a hot shower to warm up. Glad we had pool time with family. I think I am the only one in the group that is so attached to swimming in warm water as much as possible before we leave this place. It feels good to know that we will be actually moving onward and eastward at last. When we first planned this trip, we didn’t plan for any extended stays on our way to Florida, and this was a shift in plans to accommodate the joint venture south with the Brothers. It has been a fun time, and now we are ready to get rolling! We both woke up early this morning. The moon was shining in the back window over the bed and at only half full, it still seemed really bright. I had gone swimming last night after Mo fell asleep, once again navigating my way through the bobbing non-swimmers just enjoying the murmur of their conversations without having to participate. I brought two swim suits for this very reason, and at 4am when I said to Mo, “Want to go swimming?”, I was ready with a nice dry suit. The nights aren’t terribly cold, but cold enough that walking a few hundred yards from the rig to the pool is darn chilly if one is wet. Once again we were preceded by the dedicated lap swimmer, Terry, who does 2 miles every morning. Living in Lebonon, Oregon, he is now retired, farms a few alpacas, has a wife who does fiber arts, and identifies as an old hippie. He isn’t bad company that early in the morning if we must have company. We would have to swim at 2 to beat him. I tried to catch the fleeting sunrise this morning, but without a lot of clouds to reflect light it wasn’t much to look at. 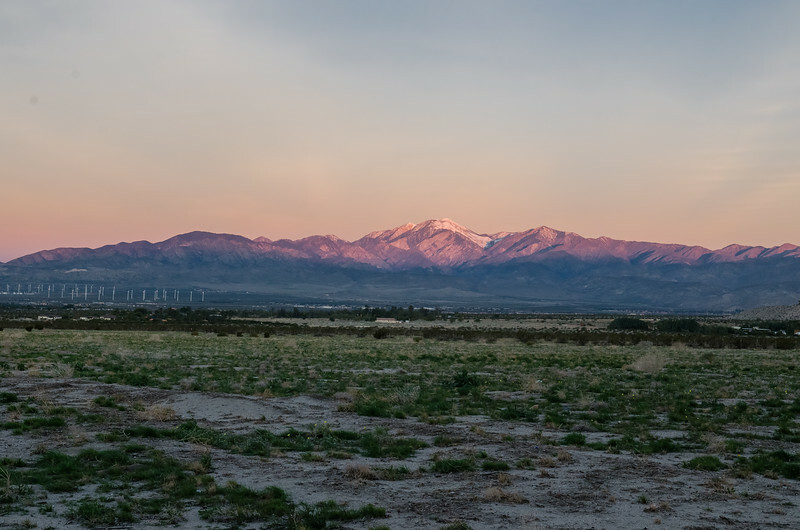 Still, the snowy peaks of Mt San Gorgonio and Mt San Jacinto glowed pink on the horizon opposite the sunrise. Our morning was easy, with big glasses of fresh squeezed orange juice. I think they are even sweeter than ever this year, even though they were small. Such a delight. 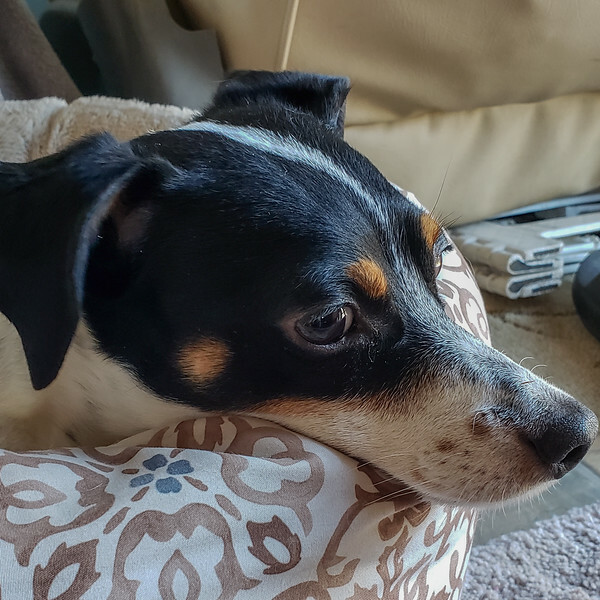 Around 11, after giving Mattie an energetic outing at the dog park, and a nice hike in the desert, we left her behind as we headed into Palm Springs. 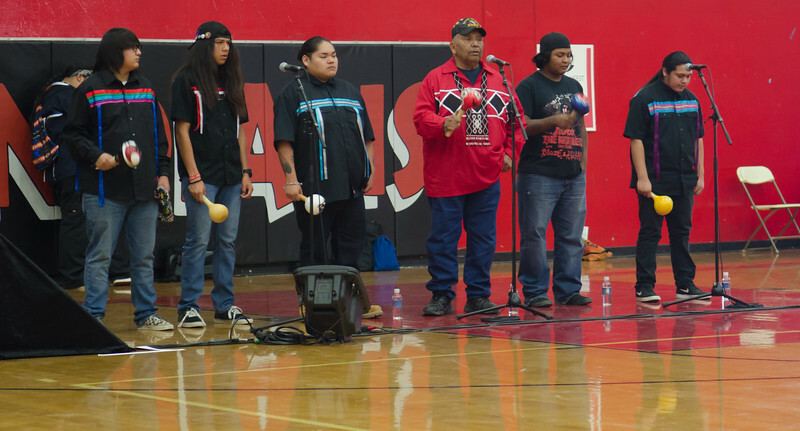 Today was the annual Singing the Birds event for the Agua Caliente Band of Calhuilla Indians. 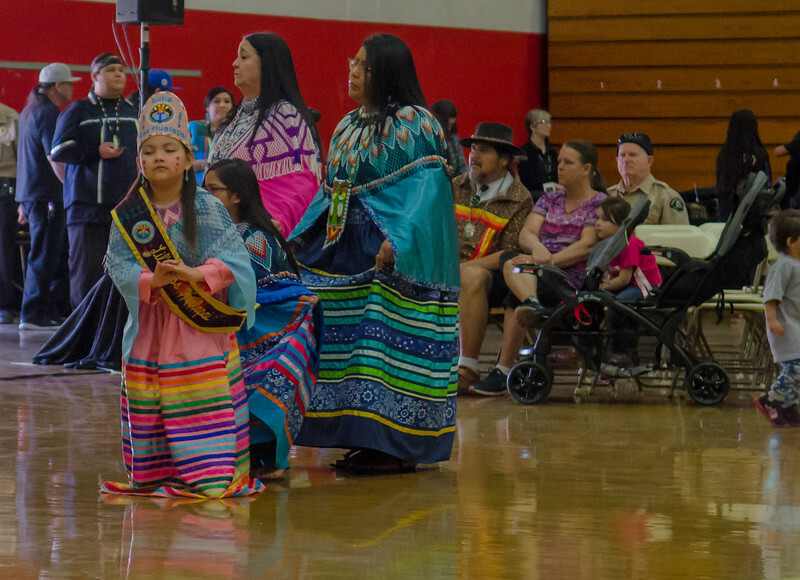 There is singing and dancing by several tribes from the Southern California area and all are welcome to the free event. 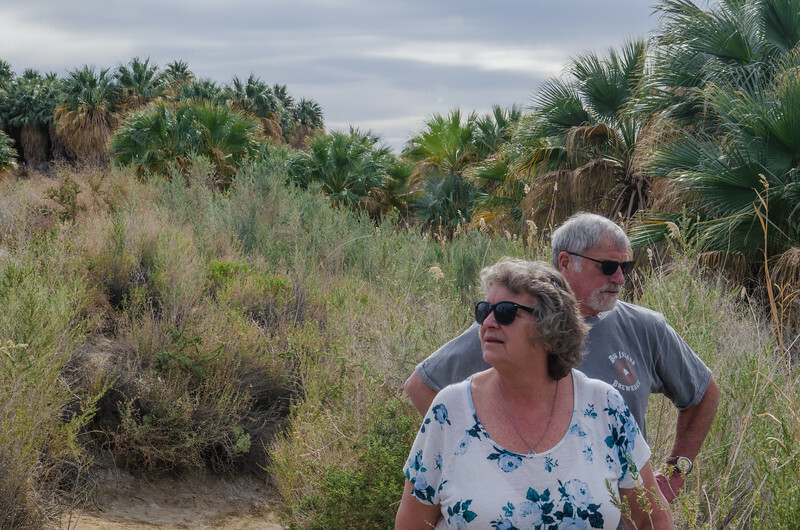 We were impressed with the new Agua Caliente Cultural Center and Museum they are building in the heart of Palm Springs. It is going to be quite fabulous. 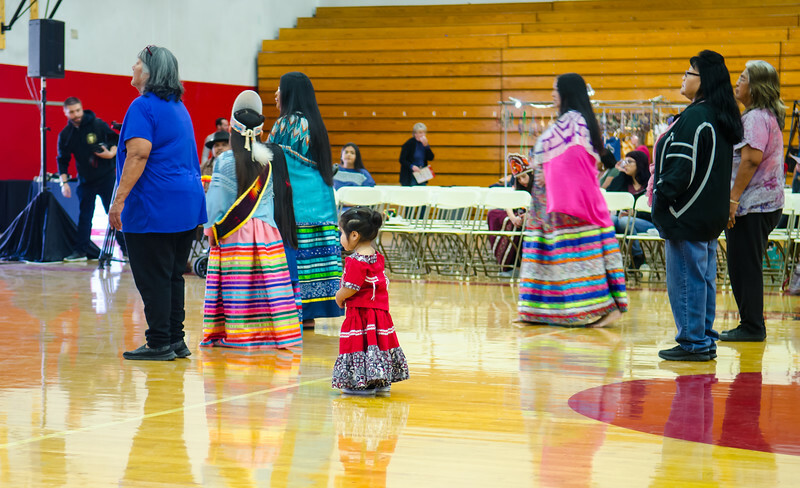 The announcer made sure we understood that this celebration is for singing about the beginning of the world, to remind the People of their roots, and the dancing is social dancing, not performance dancing. Everyone is invited to join in, but unlike some of the PowWow’s I have attended, I didn’t see any non native folks out dancing. The music was different as well because there were no drums, only rattles, which provided percussion for the singing. Still, even without the drums, the music was hypnotic, and the event was delightful to watch. We opted for a Native Fry Bread taco to share, something I haven’t had in 20 years and probably won’t need again for another 20. It is fairly bland, and the juices from the veggies really soaks into the fry bread making it somewhat soggy. 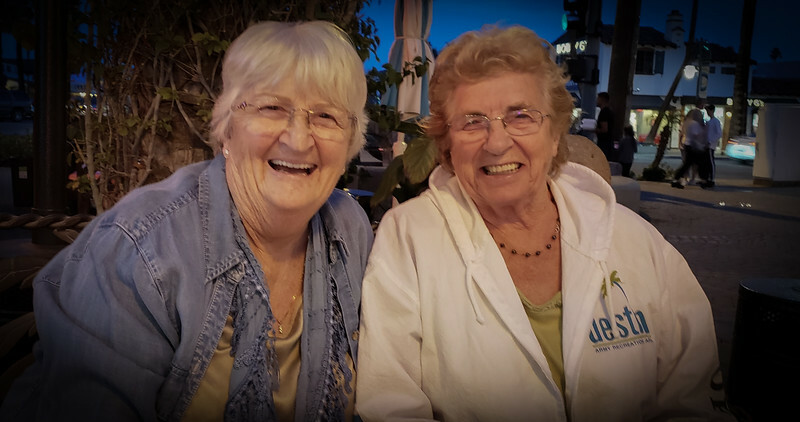 On the way home, we then stopped at the Ice Cream Shoppe, which turned out to be NOT the place I thought it was that we had visited the last time we were in Palm Springs. The Shoppe was rather upscale, with vegan ice cream, and flavors like green tea, blood orange sherbet, and Mexican chocolate. Not the place for a simple scoop of chocolate which is always Mo’s favorite, but she settled for the Brownie Sundae, and I had Cappuccino chip, which was rich and perfect. 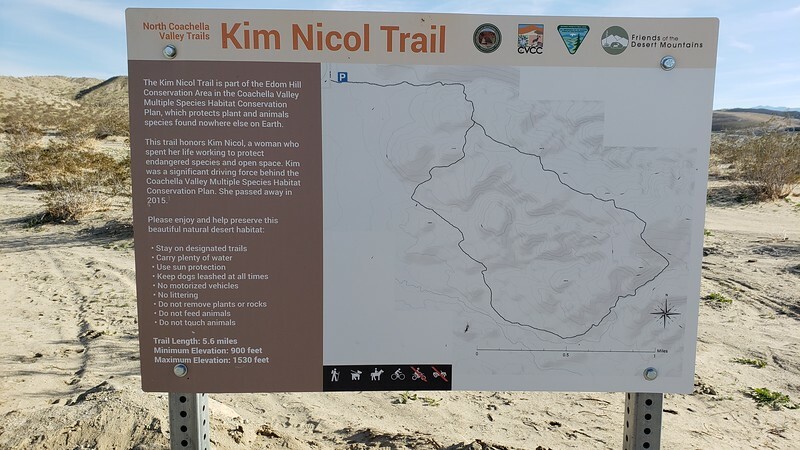 We had seen a sign for the Kim Nicol Trail at the end of our road, but couldn’t quite figure out how to find the trailhead with all the no trespassing signs posted along the dirt road. 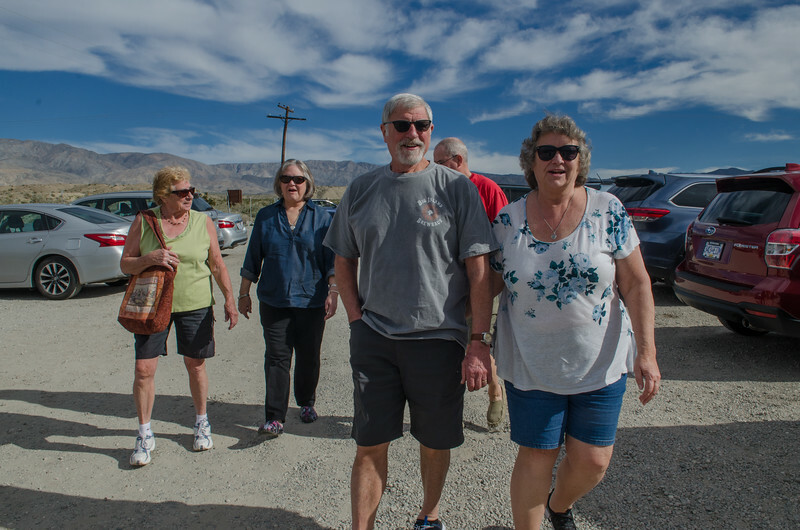 The website explained it more clearly and we traveled the half mile or so south from Catalina Resort to find the trailhead to the first officially designated trail in the Coachella Valley in the last decade. It looked like a fun hike through sandy open hills, nice in the very early morning, but fairly exposed for a daytime hike. Might have to give it a try before we leave here this time, or if not, then next time. Brothers will be returning tomorrow from Quartzsite and our time will be busy with them for the next couple of days. 75 Degrees F and brilliant sunshine! We last visited with the brothers at a wide spot in the road along Highway 247. Hugs all around, a walk for the dogs and directions to the Pilot on I-10, not far from our destination at Catalina Spa. We continued south with them to fuel up, and then waved goodbye as they continued west on I-10 and we drove back north along Indian Canyon Road toward Dillon Road. Once again, the Tracker was dead, after two days of being towed, even though Mo started it up in Lodi. Not sure why this is happening, but an easy fix. We unhooked at a wide space along Dillon Road, turned the MoHo around and jump started the Tracker without any problems. Mo left it running for some time after we got settled into our campsite, and today it started up just fine. It felt great to head east on Dillon Road toward our destination. 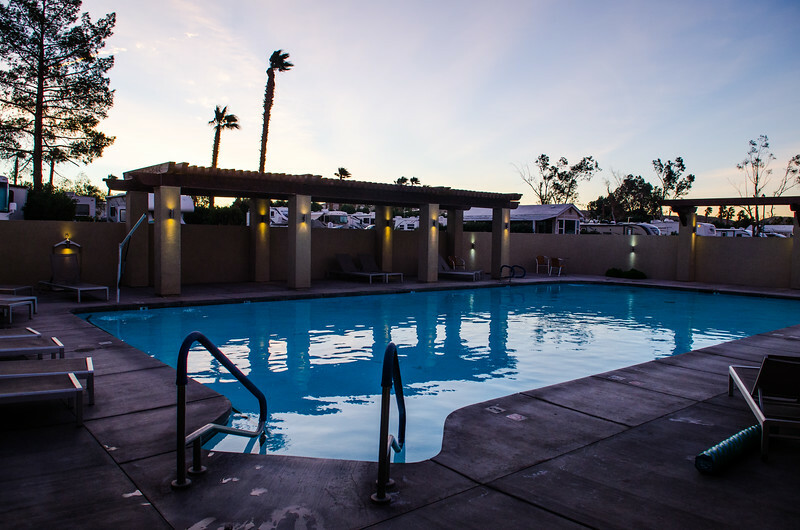 We have been coming to this part of the Mojave desert for several years, choosing the luxury of hookups and hot pools before we wander off in one direction or another into wilder places. New places are wonderful but familiarity also triggers good feelings. I like both for different reasons. Catalina Spa certainly doesn’t stay the same from year to year. We knew things were changing two years ago, and last year was proof of that. This year, even more so. 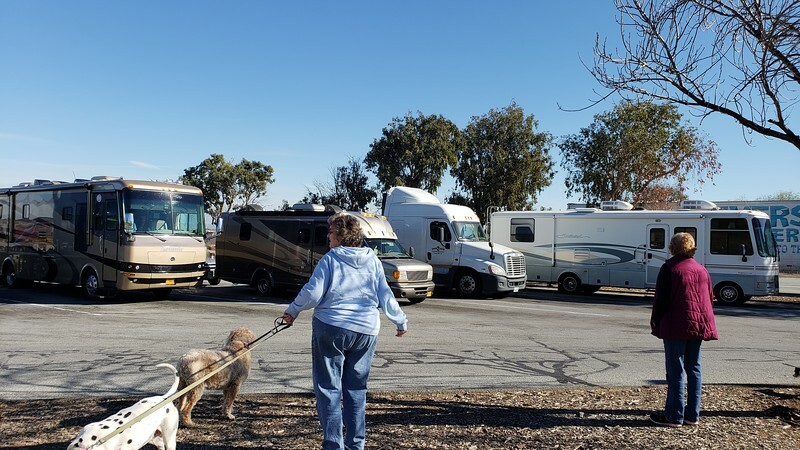 The park looks different, and I haven’t quite figured out if it is the new landscaping, the heavily pruned trees and shrubs, or the fact that it is wall to wall, bumper to bumper full of a LOT of RV’s. We had requested a spot on the back row where we have spent many good days, but it wasn’t to be. Like last year, once again we were assigned to a middle site with rigs right behind us. So far it isn’t a problem, and I was told when I asked about it that the park has to be flexible about assigning sites no matter how far in advance we made our reservation. They have to consider all the long term folks and do a lot of juggling of spaces. Also, cable is now 2.50 USD per day, which I only found out when our cable wouldn’t turn on. I asked what the problem was, and was told, “We need a credit card”. Ah well then. Internet was an additional $5.00 per day, with specific directions that it was not to be used for uploading, downloading, You Tube videos, or any kind of streaming. So much for that. I thought I might save some bandwidth by paying the extra, but certainly not worth it if I couldn’t use it. So we simply hooked up the Verizon again and will find out at the end of our billing cycle just how much bandwidth we will use as we go along. Of course, these little changes were minor compared to the best change of all. After a year of limiting pool hours, once again the lower pool near our site is open 24 hours a day. Anyone who has read this blog for any time at all knows about my love affair with crack of dawn swimming under a starlit sky. I was so happy that they reverted to the old policy. After settling in last night, we ate an easy reheated supper and enjoyed relaxing. I thought about waiting until this morning to swim, but my body was tired and sore from all the riding and driving, and the pool and hot tub was beckoning. I swam laps in between a bunch of people bobbing around on their noodles. It felt great and I do love swimming at night in the dark. We woke up at 5 or so this morning, and this time Mo decided to go to the pool with me. Such a lovely perfect time to swim. We had the pool almost completely to ourselves, except for one dedicated lap swimmer who managed to stir up a lot of waves. The pool maintenance man, Jesus, showed up at 6 saying the pool would be closed until 7 for cleaning. Not a problem, it was getting lighter out and we picked up a free cup of coffee in the game room and sat out on the covered porch to watch the morning light brighten. I took Mattie for her early morning walk into the desert and then we came back and made a tasty breakfast. It was cleaning day, after three days of travel, and within an hour we had shiny mirrors, clean floors and well shaken rugs. Always feels great when things get cleaned up and organized. We then decided to take Mattie to the little dog park, another place of big changes. They have removed all the grass and now the park is all sandy, but they added play toys and a dog pool. I miss the grass, but not the muddy puddles that would happen after they watered the grass. 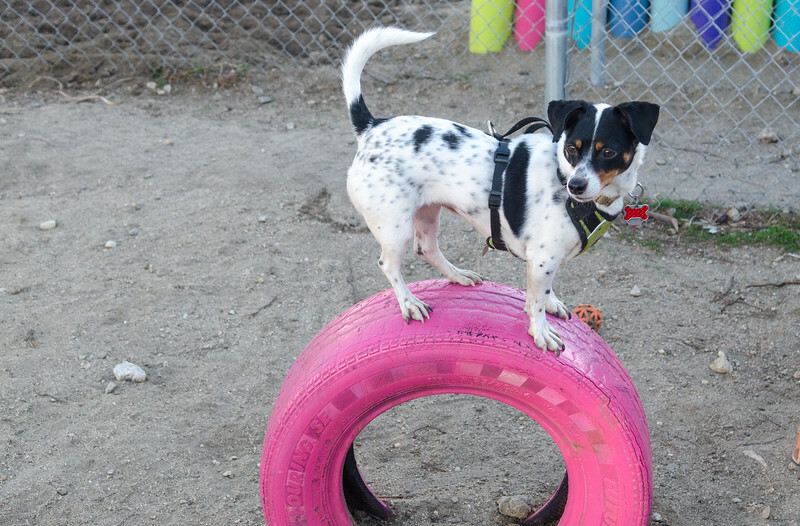 Our timing was perfect, as there was a little dog just about Mattie’s size who matched her energy perfectly. They had a great time chasing each other and playing and by the time we left, Mattie was pretty darn tired. Perfect for us, since we had to drive into Cathedral City and Palm Desert for my annual visits to the two great quilt shops that I love. I did well at the first one, and didn’t buy a thing. The second store caught me, however, with fabric that was the perfect choice for the next big quilt I will be doing for Daughter Deborah. She has some specific color requests, and while yellow and blue is easy to find, yellow and lavender is a bit harder. I was thrilled to find the perfect little print to be the focal point for her someday quilt. We did a Costco run, including the perfect lunch, a Costco hot dog, something we only manage a couple of times a year. 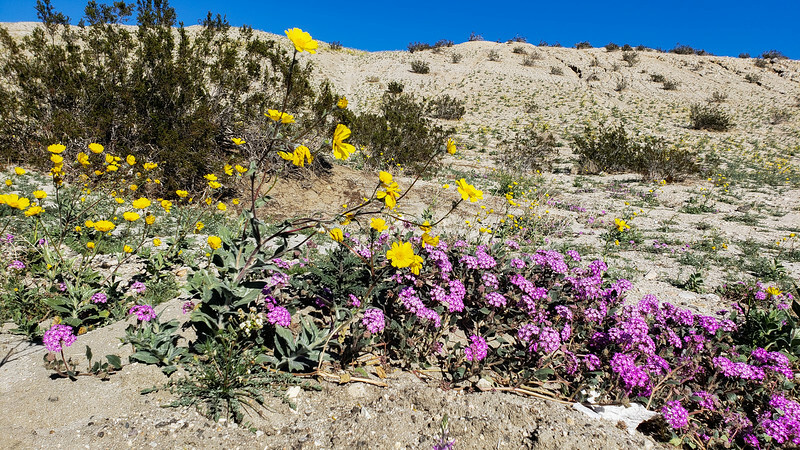 Home along the back road yielded gorgeous vistas of wildflowers blooming all over the sandy hills between the interstate and the back roads of Desert Hot Springs. This afternoon is all about relaxing, writing and reading a bit, grilling some chicken breasts for supper, and waiting for darkness so we can go back to the pools. So much nicer under moonlight than the bright sun. 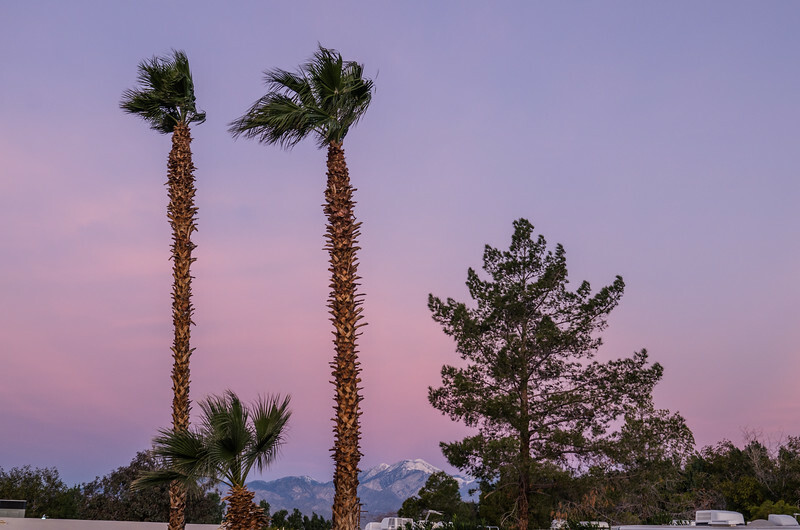 The next few days will be simple, with a special treat tomorrow at the College of the Desert where we will see the “Singing of the Birds” celebration by the local tribes. 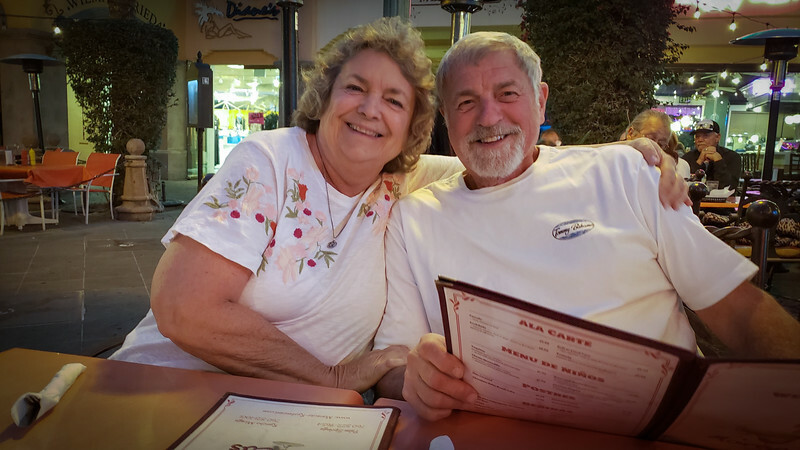 On Sunday the brothers and wives will arrive after their three day stint in Quartzsite, and we will have some more time to share with them here at Catalina before we continue eastward on our own. The good news is that yes, we are on the road at last. This time, however, we are traveling with family. Quite different for the two of us. 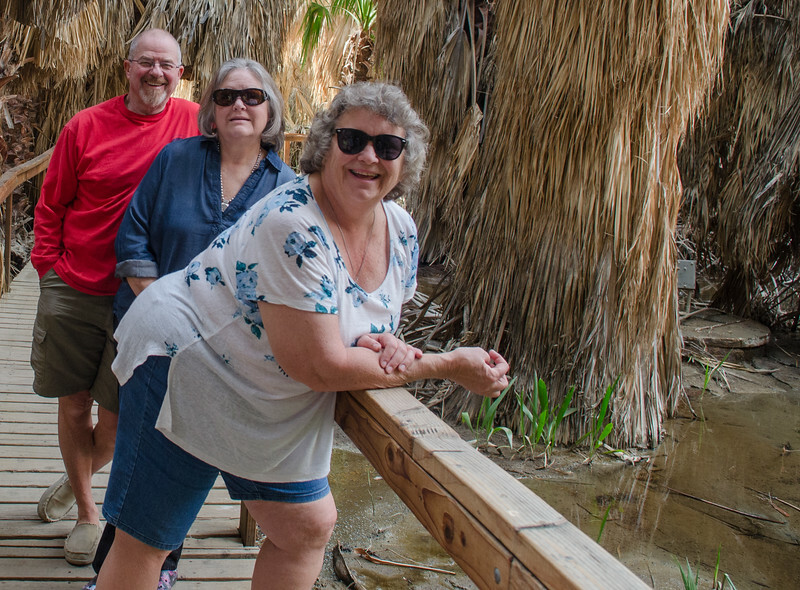 Mo’s brothers, Dan and his wife Chere, and Don and his wife Wynn, are traveling with us as far south as Desert Hot Springs. It has been fun, and somewhat different, traveling in a caravan. We are in the lead, since we supposedly know more about this route. 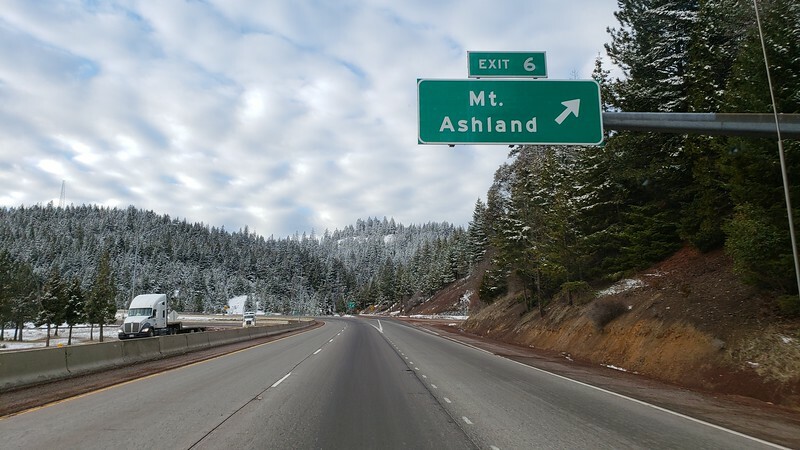 The joint adventure began on Monday, when the brothers arrived at the Sunset House in Grants Pass. We had moved the Tracker to the RV Shed, and left our MoHo half in and half out so it would be an easy hookup the next morning. Last fall when we built the new fence, we added another large gate, with entry from our quieter side street to the property and the option of an easy in and out. It was only a little bit easy, since the big rigs still had to be incredibly careful to get through the gate and pointed in the right direction down the driveway. Our driveway is simple gravel and not exactly flat, but at least level enough that the guys could level their rigs. We also managed to get power to all the rigs, and hooked up hoses so that Don could take on water. After settling in, it was time for a trip downtown to our favorite little bistro for supper. We had a great dinner at The Bohemian, in spite of the unexpected noisy late afternoon Monday crowd. We were awake early, and I baked an easy eggs benedict casserole, mixed up a package of hollandaise sauce for a good departure breakfast. Paper plates, and cleanup was quick and easy and the entire gang was ready to roll at exactly 8:02 AM. Right on time. The weather cooperated beautifully. So many times when Mo and I have embarked on this journey we have had to deal with fog and ice and snow and all sorts of bad weather. 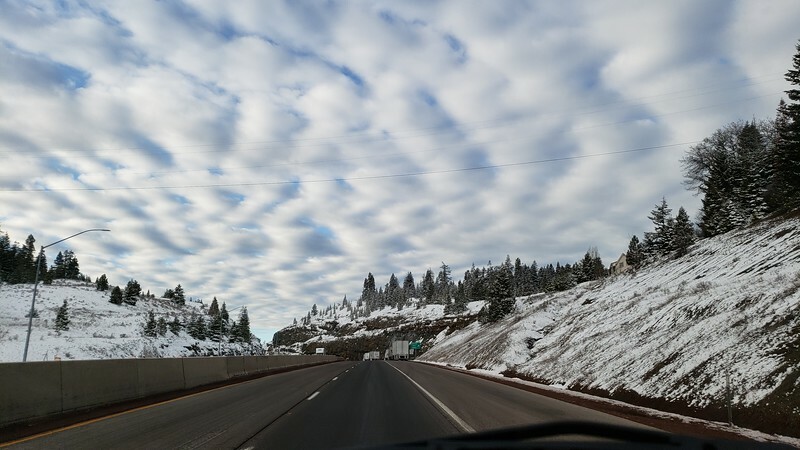 With a huge storm pounding the Northwest just days earlier, it was wonderful to see clear skies and dry roads, even over the highest point on I-5 between Mexico and Canada. It took a bit longer to get to Lodi, our first scheduled stop, because getting three rigs going after stops instead of one takes a bit more coordination. 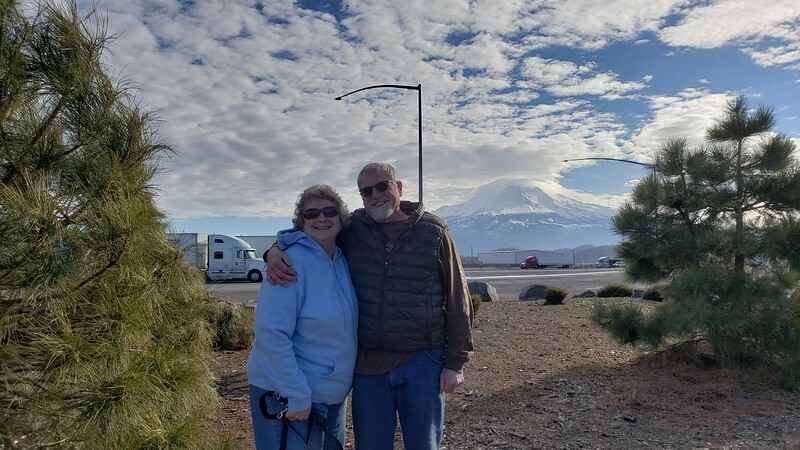 We stopped at the gorgeous rest stop with views of Mt Shasta, and again at the rest stop close to Red Bluff. By then it was noon and time for lunch, and with dog walking and lunch making, that stop turned into an hour. With a gas stop in Dunnigan, which may or may have not been necessary, we rolled into Flag City around 4pm. The distance between our house and Flag City is 371 miles, and our rig can do about 400 on a tank. Dunnigan has an easy in and out Pilot, and is just 60 miles north of our destination. The price of fuel at the Flying J was exactly the same as the Pilot in Dunnigan, $2.77 per gallon for regular. Diesel fuel is much more expensive this year, but I didn’t pay attention to the price. Dan’s rig used diesel and the rest of us are gasoline. Settling in to Flag City was quick and easy, and Dan and Don really liked the long, level, cement pads, with nice picnic tables, and spacing between rigs. With our Passport America, this park is now 33.50 per night. Can you imagine paying 67 per night for a space? Things are definitely getting expensive. I remember when we would think over $30 bucks a night was ridiculously high. We took the dogs for walks, enjoyed a glass of wine and some snacks while visiting at Dan’s picnic table and finally settled into our own rig for a quiet dinner and evening with just the two of us First night on the road is always a bit disheveled, as we try to get everything into good rolling mode. Dinner was simple, reheated ribs and sweet potatoes. 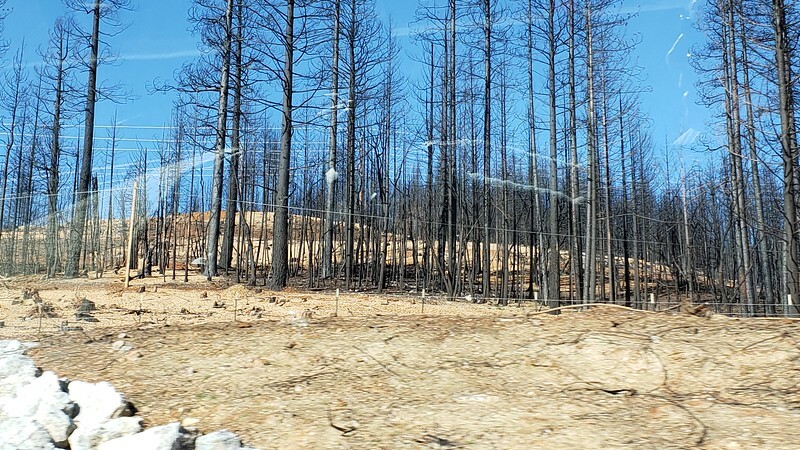 Driving through the area burned last fall along I-5 is shocking. excuse the window shot. We got a chance to check out the new TV with the park cable and it worked fine. However, the park WiFi is a joke. They have a new system, stating that the free version is for simple web surfing and email. Right. I couldn’t even load an email with it, so instead of using up our bandwidth on the Verizon hot spot, I opted to pay $2.99 for the high speed version. High speed my foot! I still couldn’t open smugmug or google photos or even get facebook to load. I set the phone hot spot, and now everything is slick and fast, but of course, I am using that supposedly unlimited bandwidth that will slow to a crawl after 22 gigs. With a couple of months ahead of us, I know we will have to get creative about when and where I upload photos and try to post blogs. And even though OLW isn’t always working for the entire process, I can at least write blogs each day and save them until I get a chance to upload, download, copy/paste, and do all the contortions I will have to do to make a blog post that hopefully is worth reading. The MoHo looks so tiny next to all the big rigs. We love our small rig! 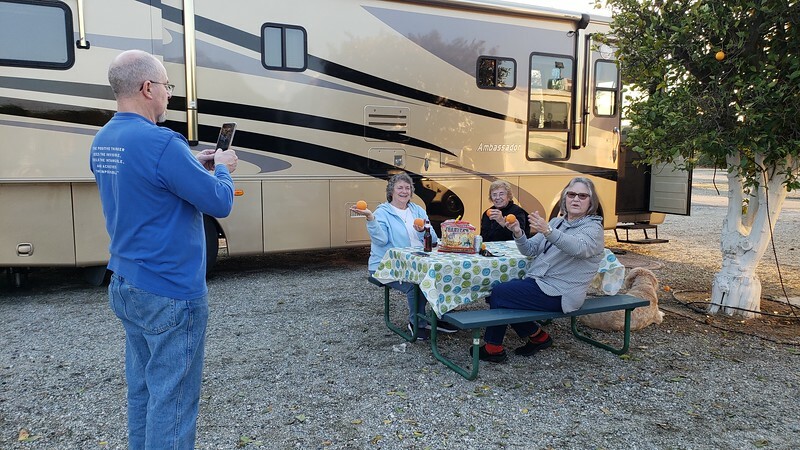 It is now a day later, and we have settled in to Orange Grove RV Park. I am on free WiFi, quick and slick and not a bit of trouble in the least. 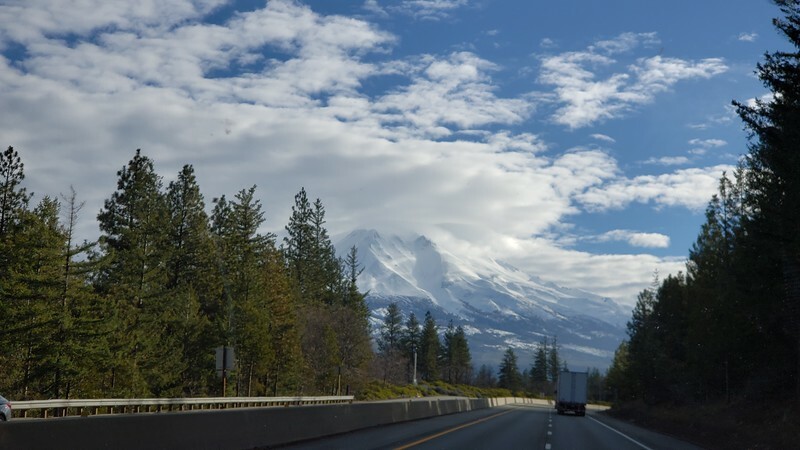 We had an uneventful and delightful day today, continuing south on I-5 through brilliant late winter green hills. Overlooking the wide valley, with heavy fog/smog to the east, we were glad for the choice to travel the 5 instead of going south on 99 through the Central Valley towns. The pavement wasn’t half bad, with many areas smoothed out from what we remember from past years. The truck traffic was heavy and fast, however, and with three motorhomes in our caravan, there were a lot of lane changes. Instead of getting fuel at Costco in Bakersfield, we chose to gas up at the Pilot in Lost Hills at $2.79 per gallon for regular, before getting off the Interstate. It was just 60 more miles to our destination, but with one of the bigger rig using diesel, Pilot is an easier choice. 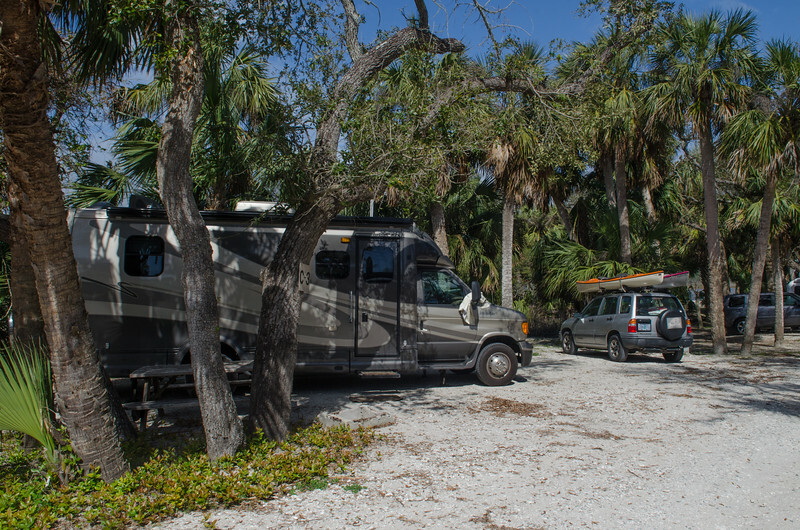 We rolled in to Orange Grove RV at 2:30, in plenty of time to settle in before evening and show the family around the park. Everyone was thrilled with the sweet oranges and in no time we had our bags filled. This year the crop is a bit different, with many small oranges instead of the big oranges we are used to picking here. Ah well, free oranges are wonderful, and the little guys are just as sweet as ever. Time for a couple of weeks of fresh orange juice. We shared a family meal at the picnic table, with a great chili stew that Don’s wife Wynn made for all of us. It was a great supper with lots of laughter. We were all tired and it was getting darn chilly so we made our goodbyes and retired to the MoHo thinking it was close to bedtime, only to discover it wasn’t yet even 6PM! All that conversation and coordination wears me out I guess. Also, dark and chilly means bedtime for me, but I at least managed to finish this blog before giving up and snuggling in with a good read and a warm comforter. Tomorrow we all head out at 8pm to drive over the pass at Tehachapi to the desert. 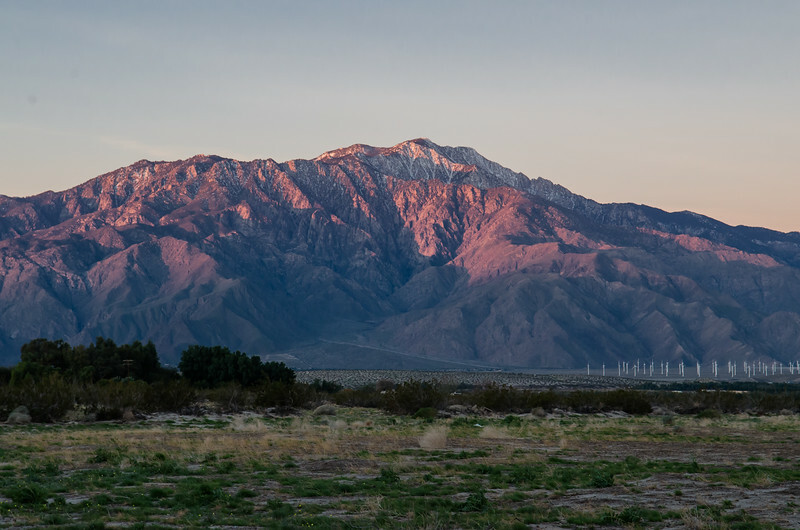 I am already anticipating that gorgeous moment when the wide open desert opens up before us on Highway 58 near Mojave. I love this drive, no matter how many times we do it. Been hearing about a few problems with Live Writer later and thought maybe I would give it a go before I have a ton of writing and a ton of photos and can’t get it to upload. So here goes the test. With a photo or two and a comment or two, of course. 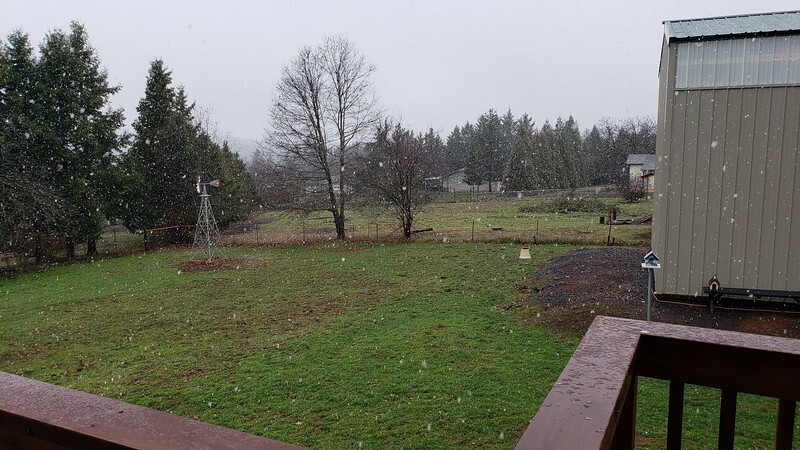 It doesn’t snow very often here in Grants Pass, but early in January we got a skiff. Lasted only a few minutes and it was gone. My kind of snow. The rest of the time has been either foggy, cloudy, or raining except for moments of brilliant sunshine that appear now and then and make everything look all technicolor. Especially the green grass of winter. I spent many days piecing the Blooming Nine Patch quilt that has been in the back of my mind since I saw a similar one at the Sisters Quilt Show in 2013. 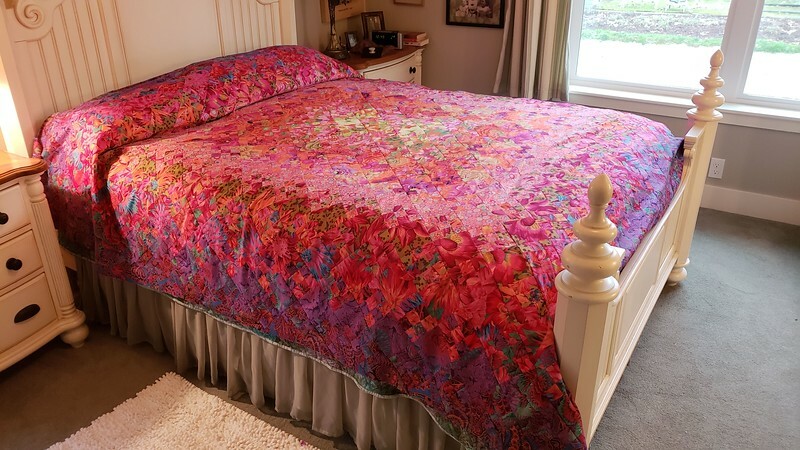 Been collecting all those bright Kaffe Fassett quilts ever since with this quilt in mind. It is a daughter quilt, destine for my youngest child, a Leo through and through, full of sunshine and drama. I somehow envisioned a sunrise as I was developing the color flow in this quilt that has more than 900 stupid little blocks! geez! 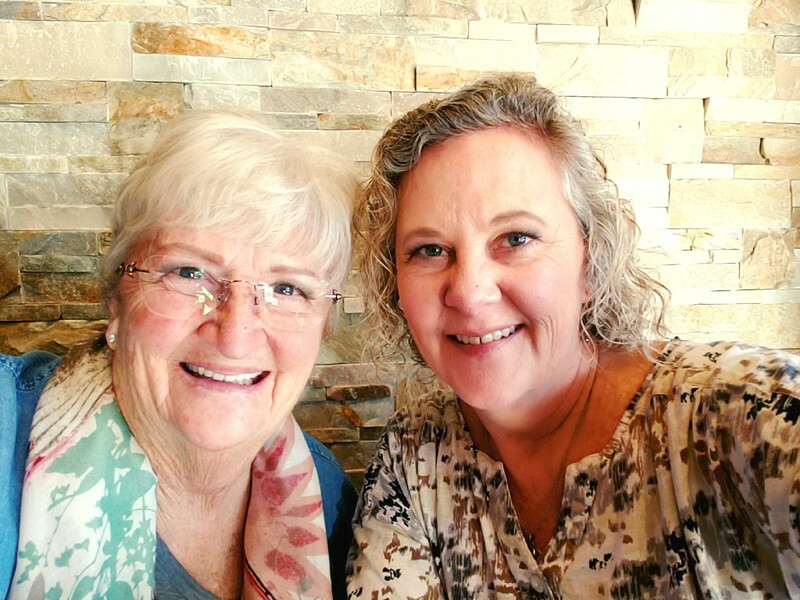 Daughter Deborah and I took a quiet Saturday to get our hair done together and then go out to lunch at the Twisted Cork in Grants Pass. Mo and I had eaten there once before, so I knew what kind of a treat we were about to enjoy. 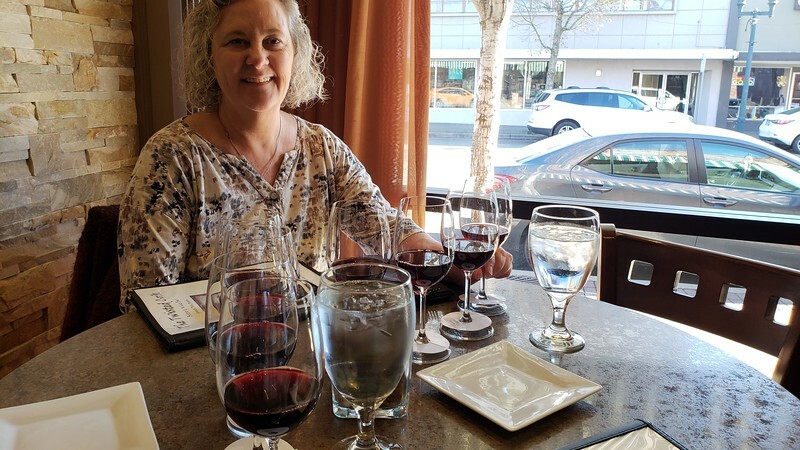 We decided on a wine flight to accompany our 3 appetizers, small cups of soup with artisan cheese bread, and the best dessert anywhere ever, their toffee bread pudding with caramel sauce. Best lunch I ever had and it took us two hours at least to eat and enjoy each other’s company. Great times like this make me so happy that she lives near enough to visit often. Speaking of living near enough, we get to leave Sunset House for our upcoming trip because this same daughter has agreed to stay at the house while we are gone. Such a relief to know someone will be around to take care of things. Kudos to her partner for giving her up for the time she is here. The days are getting close. I feel like I am surrounded with bb’s in a funnel, everything heading toward departure day. Coming up soon. So far weather reports show the current storms lessening as we get closer to leaving, and the passes should be clear as we travel south. Yippee. Now let’s see if this baby posts!